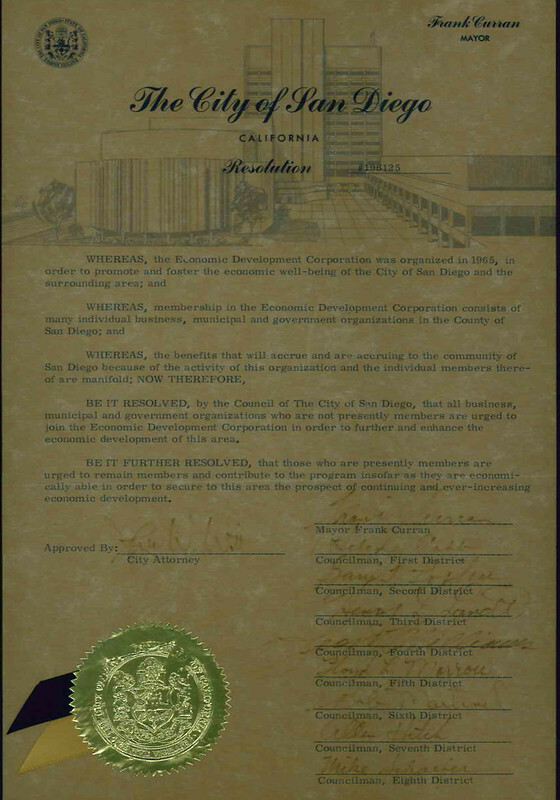 This year, San Diego Regional EDC celebrates our 50th Anniversary. But this is much more than just a milestone. To us, it’s a story about collaboration and how we’ve worked with and through our communities, businesses and partners to grow our economy. For the next few months, we’ll be going back through the archives to recount some of the economy’s – and EDC’s – most defining moments. We begin where it all started. 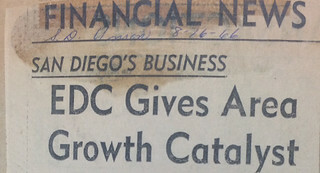 It was the early 1960s, and things weren’t exactly looking up for San Diego’s economy. The aerospace and defense industries were in decline and San Diego was looking to diversify. At the same time, City of San Diego Mayor Francis “Frank” Curran recognized the need to promote San Diego as a spot for industry and innovation . At his recommendation, an independent committee was formed, which eventually morphed into the EDC we know today. Understanding the importance of the region in the overall economic landscape, since the beginning, EDC has been focused on county-wide prosperity, working with partners from Chula Vista to El Cajon and Oceanside. 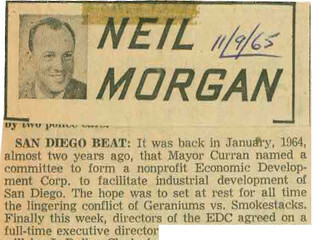 Evening Tribune columnist Neil Morgan on EDC's New Board, November 1965. 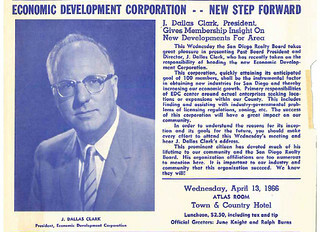 EDC's first CEO Dallas Clark, on his vision for EDC. Headline for August 1966, as economy begins to rebound. At the end of the day, this really isn’t about celebrating EDC. It’s about the communities we serve, the economy we help to support and a region we’re proud to call home. To past board members, companies, community leaders, elected officials and others we’ve worked with, thank you for working alongside us to write the region’s story. We’ll be celebrating all through 2015, but we’ll be paying homage to our past – as well as celebrating our future – at EDC’s 50th annual dinner event on June 4, 2015, at SeaWorld San Diego. Until then, join us here online every month as recount our top moments, starting with the decades that have defined us. Follow along and share your memories at #EDCturns50.